the regional municipalities of Peel, Halton, Waterloo, Niagara or Hamilton-Wentworth. 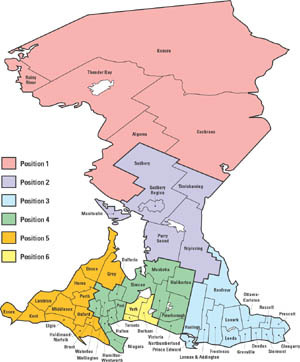 You are entitled to vote for the Northeast Ontario position if you live in the territorial districts of Sudbury, Manitoulin, Timiskaming, Nipissing or Parry Sound. any part of Québec not specified in the Northwest Ontario position. any other area of Canada notspecified in the Northwest or Southeast Ontario positions,or abroad. All College members are entitled to vote for these positions except principals/vice-principals, supervisory officers, and membersemployed in private schools or tenured or tenure-track positionsin faculties of education. If you are employed as aprincipal or vice-principal - but not as an acting principal or vice-principal - by a district school board, school authority or the Provincial Schools Authority, you are eligible to cast one vote for the principal/vice-principal position. if you are employed as a supervisory officer, you are eligible to cast one vote for the supervisory officer position. If you are employed by aprivate school, you are eligible to cast one vote for the private school ballot. If you are employed by a university at a school or faculty of education within the university as a tenured or tenure-track member of the school or faculty, you are eligible to vote for the faculty of education position.